Summary: Look at what three frisky mice find at a museum! They discover that sculptures can be big or little, textured or smooth, and made with different materials. These creative critters draw three-dimensional representations on sketchpads and with colored clay they make rectangles which they arrange into groupings that can be viewed in different ways. 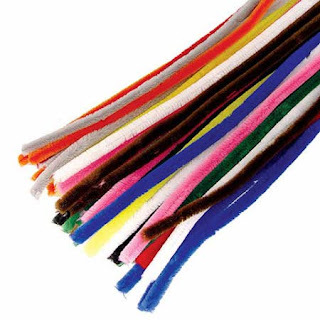 For this activity you will need a piece of Styrofoam, pipe cleaners of various lengths and widths, beads in various sizes, hole sizes and colors, and any other object with a hole in them (such as straws, pasta, etc.). Lay out the materials on the table or work area. 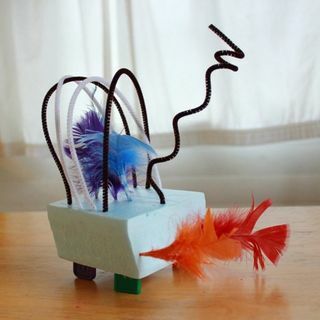 Show children how the pipe cleaners can be stuck into the Styrofoam. They can slide beads, straws, pasta, and other interesting items onto the pipe cleaners.